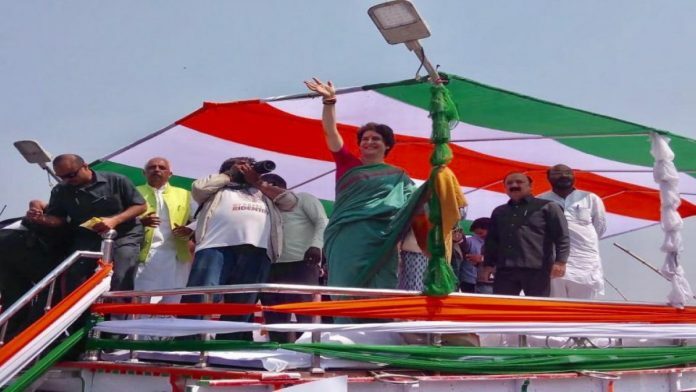 On Monday, television news alternated between two events: Goa chief minister Manohar Parrikar’s state funeral and Priyanka Gandhi Vadra’s boat campaign down the Ganga. Prime Minister Narendra Modi’s “Main hoon chowkidar” Twitter handle elicited considerable “charcha” in the evening. Aaj Tak, ABP News and Tiranga TV (owned by Congress leader Kapil Sibal) among others, traced Priyanka’s progress down the river. She was repeatedly shown waving, often to an empty embankment—at least in the footage. It was reminiscent of PM Modi’s Dal Lake boat ride where he too was seen waving to a seemingly empty lake in Srinagar on February 3. Parrikar’s last rites were telecast live in the evening before the studio debates began. Aaj Tak anchor Anjana Om Kashyap commented on Priyanka’s boat yatra. NDTV India discussed Congress failure to attract allies in Uttar Pradesh, Bengal and perhaps even Bihar. ANI’s Smita Prakash felt the grand alliance had fallen apart before it was even made. Amar Ujala’s Vinod Agnihotri tried to explain Mayawati’s stubborn opposition to Congress: she is not “angry”, she wants Bahujan Samaj Party (BSP) to be “a national party”, he said. On News 24, a discussion on Modi’s “chowkidar” Twitter status, saw BJP and Congress spokespersons shout at each other while the anchor simply watched the tamasha. News India saw even worse behaviour: Congress’s Alok Sharma referred to anchor Neha Pant as part of the “Modi media” brigade. Apologise, she demanded. “You apologise, Neha ji”, he yelled back. “You are free to leave”, she told him. Matters were more civil elsewhere. India Today looked at the Congress’s “chowkidar chor hai” campaign. BJP spokesperson Nalin Kohli mildly said he had no specific answer to the question. Anchor Rahul Kanwal promptly complimented him: at least Kohli was being “magnanimous”, he remarked. Times Now presented another “Poll Tracker” survey which gave the NDA a clear and comfortable victory: NDA 283, UPA 135, Others 125. It suggested that NDA was set to gain 13 seats after the Balakot strike. “Pramod Sawant to succeed Parrikar as Goa Chief Minister” (The Hindu) is the big headline of the day. The Hindu says the selection came “following a frenetic day of political wrangling and uncertainty”. The Indian Express is more dramatic: Sawant “enters Raj Bhavan at midnight to stake claim” — “Moving swiftly to snuff out Congress attempts to wrest power in Goa…”, it writes. Hindustan Times adds to the sense of urgency the Bharatiya Janata Party (BJP) felt: this is “a move that capped frenzied political developments in the state following Manohar Parrikar’s cremation”, it writes in “BJP chooses Sawant to lead Goa after Parrikar”. The Times of India observes the selection was anything but smooth: “…grueling discussions between BJP and its allies GFP (Goa Forward Party), MGP (Maharashtrawadi Gomantak Party) and independents delayed the swearing-in to late night”. GFP president Vijai Sardesai and MGP leader Ramkrishna Dhavalikar will be deputy chief ministers, making it “the first time that the tiniest state will have two deputy chief ministers”, TOI notes. The other big story is Anil Ambani paying back Ericsson with different point of emphasis in the newspapers. HT doesn’t even report it on page 1. TOI, Economic Times and Business Standard highlight “Mukesh Ambani Bails Out Brother Anil” (ET) or “Mukesh saves Anil from jail, clears his dues to Ericsson” (TOI). The Reliance Industries Ltd chairman “stepped in to save younger brother Anil from prison by helping him” writes TOI, in paying the Rs-453 crore Reliance Communications owed Ericsson. While Express goes with “Anil Ambani pays up, thanks ‘respected elder brother Mukesh, Nita”’, Hindu’s headline is a classic understatement: “Anil avoids jail as RCom pays up Rs. 460 crore” — and doesn’t mention Mukesh Ambani stepping in. Column space also goes to the two men who died near Vedanta premises in Niyamgiri, Odisha, after a protest turned violent. The Indian Express runs an ENS/PTI copy which states locals “tried to storm into its premises”. HT points out that one victim was a Dalit, and the security guard burned to death was from the Odisha Industrial Security Force. In “Clashes at Vedanta plant claim 2 lives”, TOI only describes the “jawan”, and not the employee. Congress makes page 1 news for different reasons. First, Priyanka Gandhi’s boat trip is a photo-op on the front pages of HT, Hindu and Express. Hindu has a single column reference to “Grand alliance in a fix as RJD, Cong talks fail”. HT and Hindu are the only two of the mainstream newspapers to comment on the reported selection on the first Lokpal, Justice P.C. Ghose. TOI and Express both take BJP and Congress to task for the argument over the hapless “chowkidar” who is at the centre of the latest war of attrition between the two. Hindu, in “Lokpal, at last”, welcomes the appointment as a “milestone”, after an “unjustified delay of five years”. It lauds the Supreme Court for its sustained pressure on the issue: “it was the court’s stern ultimatum to appoint a Lokpal within a timeframe that worked”, it writes. While it criticises the failure to pass necessary amendments to the Lokpal Bill that would have allowed the leader of the largest party to be included in the selection committee, it says that now “victims of corruption have a viable avenue of redress”. It says there are “four aspects” to the answer: the delay in passing amendments to the bill must be “rectified”; second, there is a lack of clarity on the “interplay” and “hierarchy” between Lokpal, Central Bureau of Investigation (CBI) and Central Vigilance Committee. Three, to ensure its investigations are “fair and professional”, CBI must be “functionally independent” of the government; and lastly, the Lokpal is silent on the “professional attributes” required for selecting a Lokpal. Dainik Jagran and Dainik Bhaskar lead with Sawant’s swearing in as Goa CM. Amar Ujala leads with a warrant out against Nirav Modi in the UK. The newspaper says that the diamantaire, who is an accused in the Rs 13,000 crore PNB scam, could be behind bars anytime. The newspapers also report the Rs 459 crore paid by Mukesh for Anil Ambani in the Ericsson case. Dainik Bhaskar has the interesting story of a 125-year old hotel in US – the Roosevelt in New Orleans- asking its guest to return the goods they had stolen from the hotel over the years, with the promise of a stay in its Presidential suite to the person who returns the most expensive stolen item! The filing of nominations for the upcoming polls in the state takes the lead on the front pages, today. Dinamani and TheHindu Tamil also report DMDK’s candidates list. Priyanka Gandhi’s boat finds a little space in Dinamani and Daily thanthi. Daily thanthi also has front page reports a bomb hoax at the Tamil Nadu chief minister’s home. With inputs from Shailaja Bajpai, Renu Agal and Aananth Daksnamurthy.